First let me make the following disclaimers. Everyone must do his or her own due diligence. Nothing in this essay should be considered investment advice. I am long gold and silver in the mining shares, options on futures, as well as physical. I stand to make a considerable amount of profit from a rise in the price of gold and silver. I may change my perspectives and or take profit without having time to report said changes. The motivation for this article is the recent onslaught of statements by "analysts" that the mining shares are overvalued relative to the price of gold. Indeed, many have recently said that the mining shares are currently priced for a gold price of $350/oz. These prior statements have been made without any substantiation. In this essay it is shown with the use of rigorous analysis techniques, that in general the mining shares are currently fairly valued based on historical performance. This discussion builds in part on the "Golden Bull" series of three prior essays entitled; "Riding the Golden Bull", "Trading the Golden Bull", and "The Progression of the Golden Bull". Other specific references will be given below. Well ... if "mining shares" are overvalued at the current POG, then certainly this would show up in either the XAU or HUI indices (or both). In an essay entitled "Looking for Leverage", I studied the functional relationship between the XAU and the POG. In this latter essay I developed with analysis a "representation of averages" which stated that in an average sense, the XAU = POG/4 was a reasonable estimate. With a gold price of $312/oz, this implies an XAU of 78. The XAU closed Friday at 78.36 ... not what I would consider even remotely out of the norm. The chart of the XAU is extracted from this essay for your convenience. The first data point in the graph was generated as follows. Any price of gold greater than or equal to 250 and strictly less than 255 was added to the total and then the total was normalized by the number of data points. The XAU values associated with these spot prices were also added and normalized. Thus, we have effectively looked at a "$5 bin" of gold prices to generate one (POG, XAU) data point. Note that individual contributions to this single data point may be separated by years in the overall data set. This procedure was repeated for increasing $5 intervals until the data was exhausted. Also plotted on the graph is the linear trend line (LTL) for the XAU vs. POG, and a line that represents one fourth of the POG. 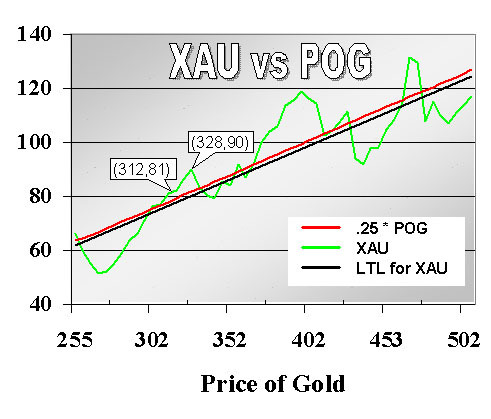 Notice that the XAU = ¼ POG is a very good approximation to the linear trend line of the entire XAU vs. POG data set. Two specific "callouts" were added to this figure. The first shows that the actual historical value (not the LTL or ¼ rule approximation) for the XAU at gold $312/oz is 81. Thus, we are actually a little undervalued based on this analysis. Further, the second point was added to show an XAU of 90 associated with a POG of $328/oz. This point was added to complement recent analysis at GE which is targeting XAU 90. If historical norms are to be followed, then a POG of $328/oz is dictated. Notice that there are specific intervals of the POG where the XAU falls significantly. Could history be telling us when major producer hedge books within the XAU are going to blow up? The major peaks appear at POG's of $328, $397, and $468. The HUI's performance as discussed below shows very little such character. HUIThe data shown in the HUI vs POG graph was created precisely as discussed relating to the previous plot. One major difference is that the XAU data set comprised 18 years whereas the HUI data set only covers the period starting in 1996. Credit is given to Adam Hamilton (a.k.a Zelotes) for supplying the original data … Thanks again Adam! 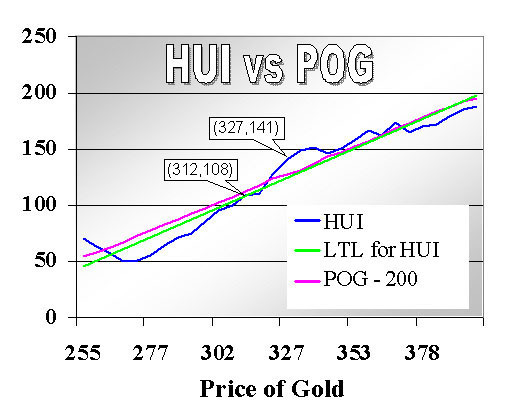 In the essay "Finding Leverage in the HUI", I applied the same rigorous analysis techniques to conclude that in the sense of averages, a good approximation for this index is HUI = POG - 200. With $312/oz gold, this implies an HUI of 112. The HUI closed Friday at 112.34 ... again not what I would consider even remotely out of the norm. Note further that the "HUI graph" supplies two callouts. The first gives an actual value for the HUI of 108 for a gold price of $312/oz. The second gives a value of 141 for a gold price of $327/oz. These points were chosen to roughly coincide with the callouts from the "XAU graph". Note that the HUI shows no traumatic periods of underperformance for any intervals of the POG. ConclusionThis essay has tried to give the reader some idea of the "XAU & HUI Performance in the Golden Bull". Note that the historical relationships developed above have specific ranges of the POG inherent in their conclusions. Be careful not to assume that these relationships hold for the POG outside of these ranges. Based on the preceding discussion, I think that a couple of conclusions are in order. First, analysts who are currently making general unsubstantiated statements to the effect that mining shares are overvalued relative to the POG, are ignoring historical valuations. Second, it appears that in addition to the decreased leverage discussed in my prior essays there is yet another reason to avoid hedged producers … history has clearly shown that these shares run the risk of declining against a rising price of gold! Finally, consider that the components of the mining shares have stressed cost control to survive in this multi-year bear market. Thus, it might be reasonable to expect that they will outperform these historical norms. However, in that the conclusions of these essays, written in June of 2001, correctly predicted the current relationship between the POG and the XAU (HUI) within .4% (.3%), perhaps the declining supply or other factors are neutralizing these assumed cost control efficiencies. As I said in my last essay, I am toying with the idea of spending more time analyzing the gold market. In order to do this, I would need interested readers to subscribe to an annual daily column for $50 to $75 (of your hard earned $s) per year. If any of you think the musings of this gold bull might be of interest in this format … drop me a line at the email below. The response so far has been very good and I wish to thank (!) each and every one of you. Right now I have what I consider to be 25% of "critical mass". If you think this idea is of merit, you may wish to mention it to a friend. I hereby commit that if (when) I attain critical mass, I will begin the column discussed above. Its true value may be in helping everyone to keep a watchful eye on exit strategies as the "Golden Bull" goes parabolic!